Training plans takes the mystery out of improving. Custom-tailored to your time, experience level and goals, you’ll be better focused and achieve better results when you follow a plan. Stick to a Training Plan and you’ll improve as a cyclist. It’s as simple as that. 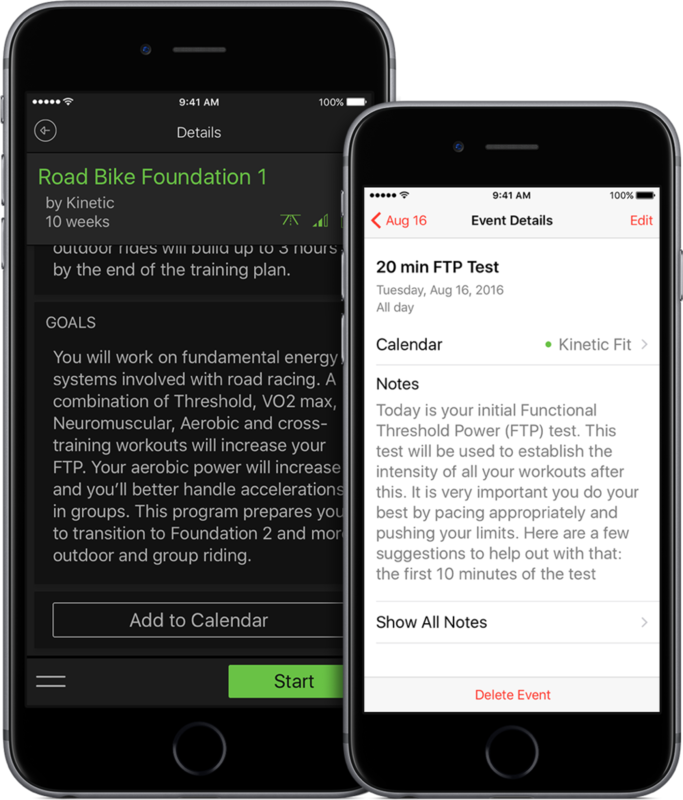 We’ve included Intro to Power 1 for free with the Kinetic Fit app. Our Fitness Training Plans can be started any time by most levels of riders. Intro to Power Training is a perfect starting point for anyone unfamiliar with interval training and will teach pacing and cadence changes and prepare you for more advanced Training Plans and workouts. For riders with more specific racing or event preparation goals, we recommend picking your preferred discipline and progressing from Foundation 1 to Foundation 2 to Race Prep. Following a periodized progression builds a solid aerobic base to help you peak higher and longer at Race Prep. It’s easy to stay on track with a power-training plan when you add it to your calendar and receive daily reminders. A new “Kinetic Fit” calendar will be added to iCal or your device calendar with a separate workout entry for each day. Many of our Training Plans include optional indoor or outdoor days, cross-training workouts and workouts with built-in calisthenic bursts. Our goal is to encourage healthy lifestyles and fit athletes. Sometimes getting outside is better for you than another day in the pain cave. Life happens, varied and busy schedules and occasional interruptions require a flexible Training Plan. Our plans can be started on any day of the week to put your longer workouts on available days off. If you miss a day, just pick up on the current day.